Military information, particularly classified information about threats or potential enemies, is called "intelligence." As in other branches of the military, Navy Intelligence Specialists analyze intelligence data, interpreting and breaking down information to determine its usefulness in military planning. From this intelligence data, they prepare materials that affect strategic and tactical areas all over the world. This rating (which is what the Navy calls its jobs) has the Navy Occupational Specialty (NOS) number B600. It was established in 1957 and called the Photographic Intelligenceman rating. The title was changed to Intelligence Specialist in 1975 since there is much more involved in intelligence than photographs, and not everyone in the rating is a man. 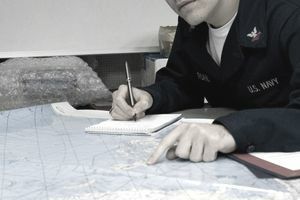 In addition to analyzing intelligence data, Intelligence Specialists prepare and present intelligence briefings, prepare materials for reconnaissance missions, use maps and charts to produce imagery data, provide input and receive data from computerized intelligence systems ashore and afloat, and maintain intelligence databases, libraries, and files. Intelligence specialists perform most of their duties in an office or watch environment. They usually work closely with others, doing mostly analytical work, but must have the capability to work without supervision and to support the intelligence mission of the Navy on land, undersea, at sea, and in the air. Intelligence Specialists serve aboard ships, in aircraft squadrons, and at various intelligence production centers located in the United States and overseas. A high school diploma is needed, and applicants for this rating and their immediate families must be U.S. citizens or from a low-risk country (according to Intelligence Community Directive 704). Former members of the Peace Corps are not eligible for positions in military intelligence. Any previous offenses that are considered "moral turpitude" will likely disqualify applicants. Normal color perception is required as well as vision correctable to 20/20. Applicants must be eligible for a Top Secret security clearance, with a Single Scope background investigation. Personal security screening interview will be conducted by a Naval Security Group Command Detachment Great Lakes special representative. A combined score of 107 on the Verbal Expression (VE) and Arithmetic Reasoning (AR) sections of the Armed Services Vocational Aptitude Battery (ASVAB) test is also required to qualify as an Intelligence Specialist. Once they've completed boot camp, sailors in this rating receive 13 weeks of formal Navy technical training at "A" School in Dam Neck, Virginia. Next will be up to 13 weeks of advanced training at "C" School.